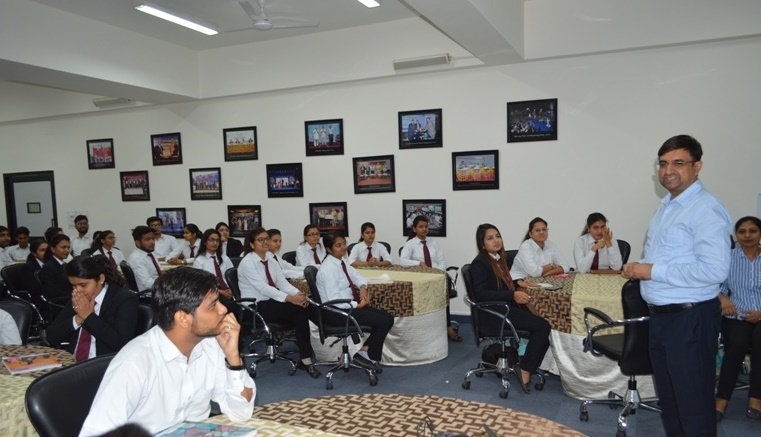 Jaipuria Institute of Management, Indirapuram, Ghaziabad conducted a guest lecture on “Journey to Happiness & Peace” on 31st Oct, 2018 for MBA students. The session was delivered by Mr Amit Sharma (Manager), a senior member of the Learning & Development team and Ms Sini Joseph, Associate Manager, Talent Management Group from Nucleus Software. Mr Amit Sharma discussed with MBA Students not to make their pursuit of Happiness more complicated. He further said to make happiness a habit which can be controlled by them rather than seeking happiness from any external sources. Moreover, Ms. Sini told the students that Life is a series of Moments and the key to happiness is living each one with purpose. Overall the session was highly informative and educational.